The best kind of ninja is, obviously, a rogue one! With this Rogue Ninja Costume, you'll look like you ditched your clan a while back in the pursuit to be the greatest warrior the world has ever seen! Were you part of the Iga clan or the Koga? Who knows? Not us, that's for sure, but we'll bet that you've trained under the best of both clans and have perfected the way of the ninja! Jump into this robe/pants combo and look like the deadliest mercenary. This nearly all black costume will help you sneak around in the night with no chance of being spotted. You'll easily be able to complete any mission you get hired for, whether it be espionage, sabotage, or assassination, success will be yours without a doubt! Just make sure you get some subtle and silent footwear, maybe not your bright white Nike sneakers... think slip-ons. Not slippers, though! Ain't no self-respecting ninja running around in his fuzzy bunny slippers. 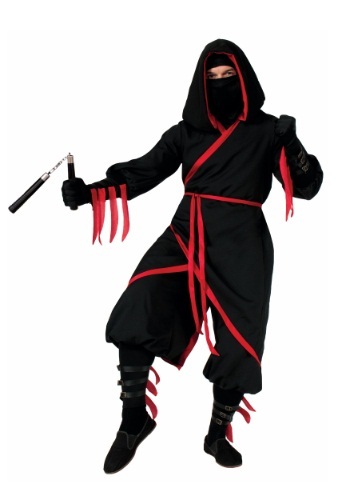 Now that you've concealed your identity with this awesome Rogue Ninja Costume, all you need is the proper weaponry! Carry around a katana on your back, an array of shuriken in easy to reach places and a pair of kusarigama at your side. Once fully equipped you'll be the most powerful Ninja walking the streets! If you're ready to join the ranks of the greatest warriors in history then grab this costume and start learning the way of the shinobi. Add to the legends that surround the ninja. Blow people's minds with your abilities to seemingly turn invisible, shapeshift, and even fly! How? Don't ask us, you're the ninja!